To prepare the puffs: Preheat the oven to 400°F. Mix the pancake mix, corn flour, cinnamon, baking soda and sugar in a medium-sized container. Lightly beat together the egg and oil. Add the egg wash to the dry ingredients. Incorporate the applesauce and yogurt and stir until all ingredients are fully combined. Grease a few mini-muffin pans with non-stick cooking spray. Fill each muffin mold 3/4 full. Bake for 10-12 minutes or until lightly golden brown, and when a toothpick inserted in the center comes out dry. Remove puffs from mold and let cool for about 3 minutes. To prepare the topping: Mix the sugar and cinnamon in a bowl. Dip the top of each puff in the melted butter, preceded by the cinnamon-sugar mix to coat. Save time: use an ice cream scoop, approximately 1.5 inches in diameter, to fill the mini-muffin molds. It's the perfect size for portioning out batter! My eyes tend to wander to the apples while at the grocery store, and I usually leave the produce section with three different kinds of apples on each trip. If I purchase too many to enjoy them before they spoil, I whip up a batch of quick applesauce. One of the most delicious ways to use this homemade applesauce is in this applesauce puffs recipe. 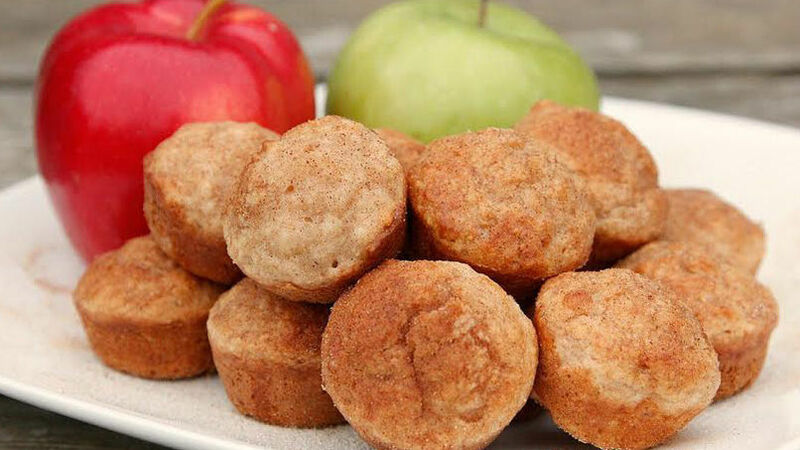 These puffs are truly a delicacy: cinnamon, apple and yogurt come together to form small, soft puffs. You'll see: they go fast! They're perfect for snack time and can be packed in school lunches as a sweet dessert. Be inspired, and try this recipe today!